In just a few more weeks, the conversation surrounding new smartphones is going to take a major turn, as it tends to do around that time every year. With the new flagships of MWC (and those that launch independently in the days that will follow), we're going to be talking about the cream of the smartphone crop, and how this batch of high-end models promises to shape the arrival of the rest of the year's hero phones. But right now, in the wake of CES (and its lack of major new-phone announcements), the landscape is very different, and our conversations have circled more around the idea of value: really well-balanced handsets that keep prices as low as they come, while also still fighting to deliver a premium feature or two. A couple weeks back we gave you an in-depth look at the Honor 6X, a solidly outfitted mid-ranger that was selling for the very attractive price of just $250. That's a great start, but can we go even lower, while not sacrificing a lot of quality and features? ZTE thinks we can, and just like Honor, it's got an affordable new option that packs a fancy dual-rear-camera system, just like some much more expensive phones. 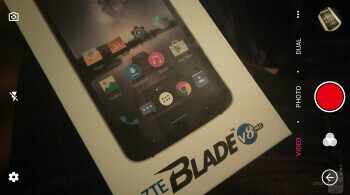 Let's take a look at the ZTE Blade V8 Pro, and see if this really could be one of the new year's best values. 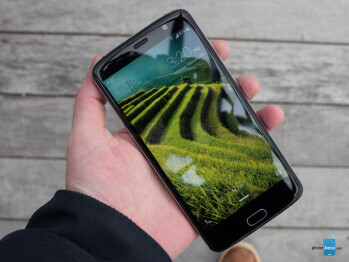 The Blade V8 Pro is handsome and decently built, but it can't quite shake off its mid-range positioning, and comes across as a handset that falls somewhere south of premium. Don't get us wrong: this isn't some cheap, plastic mess. The handset features a metal band around its frame with attractive beveled edges, 2.5D curved glass, and a subtly arching back panel. But the phone's rear is also crafted out of rubberized plastic, in a time when we see higher-end metal construction coming to even budget-priced hardware. That back panel doesn't look bad-bad by any stretch, but its textured surface does have a bad habit of picking up crumbs. And compared to the metal-bodied Honor 6X, with which the Blade V8 Pro shares a 5.5-inch screen size, ZTE's handset is thicker, taller, heavier, and just generally feels bulkier – in spite of Honor's _phone_ getting the bigger battery. 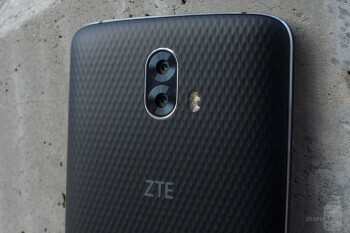 Lest you get the idea that ZTE's design is full of bad decisions, the Blade V8 Pro does enjoy an impressively flush camera (not really sticking out at all), a modern USB Type-C connector on the handsets bottom edge (where it sits next to the phone's speaker), and it manages to hold onto its headphone jack. ZTE makes the interesting choice to go with a front-mounted fingerprint scanner, integrated into the phone's home button. It works OK, but accuracy is sometimes a little iffy (requiring repeat scans), and having to physically press the button to unlock the phone feels less graceful than some other fingerprint-scanner implementations. 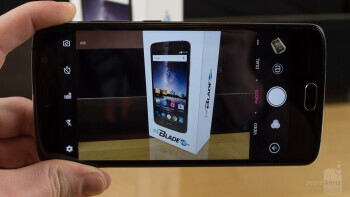 All things considered, the Blade V8 Pro is put together quite nicely, and looks reasonably attractive. The phone's just a little large, and doesn't go quite far enough in terms of premium-feeling materials. Then again, this is a mid-ranger, so perhaps we shouldn't be that surprised. 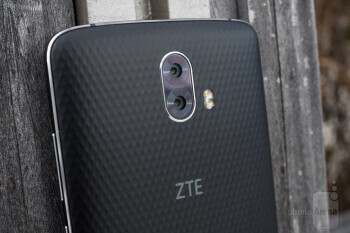 ZTE hooks the Blade V8 Pro up with a 5.5-inch screen offering a 1080 x 1920 resolution, a combination that just about screams “mid-range display” these days; it's big enough to scratch that phablet itch that so inescapably has infiltrated phone design, while also providing a suitably sharp screen. 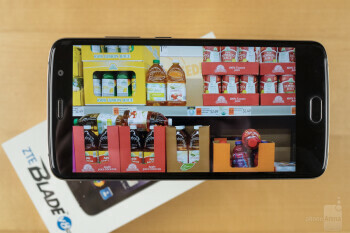 Leave it to the flagships to endlessly debate the value of Quad-HD resolutions; phones like the Blade V8 Pro are plenty confident stopping once they hit Full-HD. Compared to most of the smartphone screens we look at, the V8 Pro's is definitely on the brighter side, and considering all the comparisons we've been drawing to the Honor 6X, it seems worth mentioning that both models came in with near-identical screen-brightness measurements. While that 500 nits of output will fight admirably against a sunny day, we'll admit that we did find ourselves in outdoor-usage situations where we wished we could crank that brightness higher, still. Color accuracy is slightly better than we saw on the 6X, to ZTE's credit, but it's still not perfect: maybe “inaccurate in a different way” would be an apt description. Where the Blade V8 Pro suffers, though, is in the lack of software controls to further tweak image balance: what you see is largely what you get. That back panel doesn't look bad-bad by any stretch, but its textured surface does have a bad habit of picking up crumbs. And compared to the metal-bodied Honor 6X, with which the Blade V8 Pro shares a 5.5-inch screen size, ZTE's handset is thicker, taller, heavier, and just generally feels bulkier – in spite of Honor's phone getting the bigger battery. ZTE's Android interface is one that's quite familiar by this point, giving us an experience that keeps comfortably close to standard Android interactions, while offering just enough extra to help make itself feel worthwhile. If you don't feel like tapping into any of those ZTE extras, the good news is that they're mostly unobtrusive, to say nothing of optional. Maybe the biggest stand-out you'll run into during regular usage is a simplified “frequently used” panel for the phone's settings screen – but even that is just one swipe away from the standard, full-featured interface. Venture a little deeper into ZTE's software and you'll find a theming engine, custom lockscreen settings, a healthy smattering of gesture controls, and the persistent on-screen Mi-POP interface. The latter gives you quick access to UI navigation shortcuts at the expense of screen real estate; that could be ideal for certain users really set on one-handed phone operation, but like the rest of these features, we're just happy that ZTE lets us decide for ourselves whether to take advantage of it or not. No one's going to be surprised to learn that a mid-range handset like the Blade V8 Pro can't compete with the latest batch of cutting-edge smartphone silicon, but we're more interested in how the phone compares against other recent budget-priced models. The good news there is that the answer is “quite favorably.” The Snapdragon 625 chip ZTE uses to power the phone strikes a nice balance between processing performance and power efficiency, and the 3GB of RAM means the phone is sufficiently armed for some moderate multitasking. 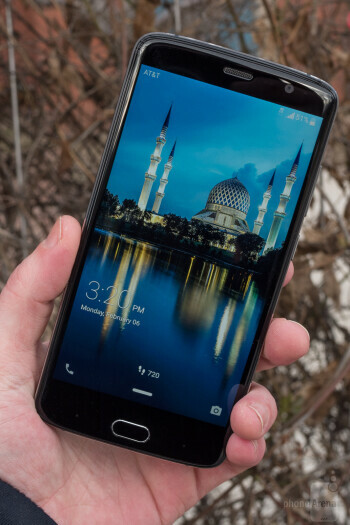 Unsurprisingly, the Blade V8 Pro performs right in line with other handsets based on that same hardware combination – phones like the summer's Moto Z Play Droid. 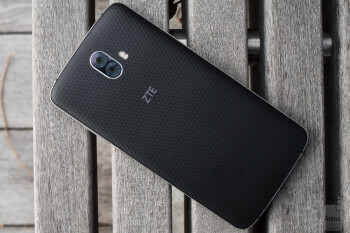 But while that's a $400 phone, ZTE manages to sell the V8 Pro for significantly less, making this kind of performance start to feel like a real bargain. There's only one storage configuration to worry about, with 32GB of space for system resources and files. Should you need more than that, we see the return of a hybrid dual-SIM tray with support for microSD expansion – you guessed it – at the expense of that second SIM card. 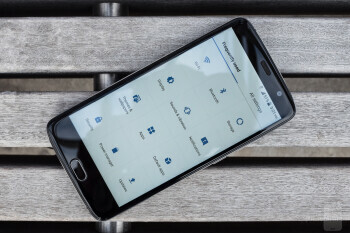 We just mentioned the dual-SIM option, which is hardly a rarity at this point (and admittedly, a feature we doubt a significant percentage of users even tap into), but it's still very much a feature in favor of the Blade V8 Pro's connectivity suite. The phone supports LTE bands 2, 4, 5, 7, and 12, and during our testing we had no problem operating the handset on AT&T's network. There's no real surprises in the wireless connectivity field, with the expected assortment of Bluetooth and Wi-Fi support. NFC compatibility is present, while the phone skips other extras like infrared. One pleasant addition lands in the wired connectivity department, with the phone picking up a USB Type-C port. 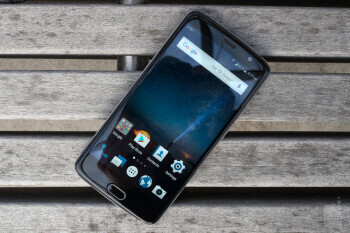 While that's hardly going to convince you to buy the Blade V8 Pro on its own, it's still something that's easily overlooked on mid-range handsets – “why waste fancy new hardware on budget phones?” we can almost hear manufacturers asking themselves – so it still manages to be something we do notice when it is present. Not too long ago, manufacturers reserved dual camera systems (and we're talking about dual main cameras, not a primary camera and a front-facer) for their flagship models, and why not? It's difficult to look at doubling-up on camera hardware as much other than an extravagance, and while such arrangements promise enhanced fidelity and access to some special photographic effects, you're not likely to get twice as much out of it as you would a single camera – hence, the mostly-reserved-for-luxirous-flagships status. We've spent a lot of time comparing the Blade V8 Pro to the Honor 6X, and with good reason, as both these phones aim to bring dual cameras to the masses. But while the 6X paired a high-res main camera with a lower-res auxiliary lens, the V8 Pro doesn't skimp on its cameras with a pair of full-res 13MP sensors – not too far off from the arrangement on the higher-end Honor 8. Does that give the V8 Pro a real advantage in the budget-two-camera category? As we'd only expect from a smartphone with two 13MP cameras, images look good – really good, in fact. While the camera software supports the expected helping of special effects like a wide-aperture bokeh mode, and selective coloring, the Blade V8 Pro's dual cameras shine even when you're just straight-up taking regular photos. Capture times are swift, colors look accurate and well-balanced, and the software handles tricky exposures – like shooting right into the setting sun – with grace. Is it the best dual-camera system out there? That's going to take some much more detailed analysis before we can say with much certainty, but initial impressions with the V8 Pro very much do not disappoint. And that ZTE is able to give us such strong camera performance at such a low price only paints the Blade V8 Pro in a more attractive light. While the V8 Pro puts on a strong showing in the still-images department, the same can't necessarily be said for video recording. The good news is that the phone supports extra-high-res 4K shooting (in addition to the expected 1080p and 720p), and the footage it captures is nice and sharp. But then it's downhill from there. Audio captured alongside our videos was way too loud, with levels peaking and distortion popping up even when recoding voices at conversational volumes. We also saw the V8 Pro struggle with refocusing during recording, taking slightly longer than other cameras to acquire new subjects, and often having trouble recognizing them at all. And without any extra stabilization, footage had a tendency to look really shaky. That's a shame, especially because still photography proved to be so promising. So far the Blade V8 Pro's been more hits than misses, but if you'd been thinking that this phone had to falter somewhere, you'd be right. Now, bottom-edge speakers like we find on the V8 Pro are rarely our favorite thing in the world; they're better than rear speakers, granted, but tend not to stand up well against front-facers. But all of that is still contingent on our being able to hear them, and unfortunately for the Blade V8 Pro, its speaker is seriously quiet. In fact, it's just about the quietest handset we've ever tested, and while it's not so much quieter than its peers that you're not going to be able to hear the V8 Pro at all, nor should it be your first (or second, or third) choice for the phone to crank out the tunes at an impromptu get-together. That's a real shame, because so much of the rest of the phone's hardware is quite competitive. Thankfully, headphone audio quality (and volume) is right where we'd like it to be, and while wired headphones may be an accessory on the way out, we're grateful to find support here. As may not surprise you from our discussion about sub-par volume output from the Blade V8 Pro's speaker, voice calls can also be a little on the quiet side. Not so quiet that we couldn't hold a conversation (much like the speaker itself should be plenty adequate so long as you aren't fighting against a ton of ambient noise), but we did find ourselves asking callers to repeat themselves occasionally. That's not helped by the phone's size, and while this 5.5-incher is only slightly larger than other similarly equipped models, the effect is enough that the phone just feels big in your hand – such that we found ourselves very aware of the V8 Pro's size and and how we were holding it. 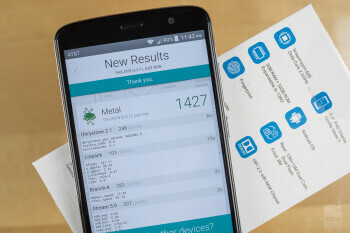 Qualcomm did mid-range phones a great service when it released its Snapdragon 625 processor, and the combination of that chip and the Blade V8 Pro's 3,140mAh battery adds up to a phone that won't struggle to achieve day-long battery life; in our custom tests we measured about eleven-and-a-half hours of continuous screen-on time. That's damn impressive, and while we might have been able to live with slightly less stamina if that gave us a thinner, lighter phone (which – we know – is almost sacrilegious to say, but the V8 Pro really does have battery life to spare), we can very much appreciate ZTE's choice to give this handset all the juice it needs. 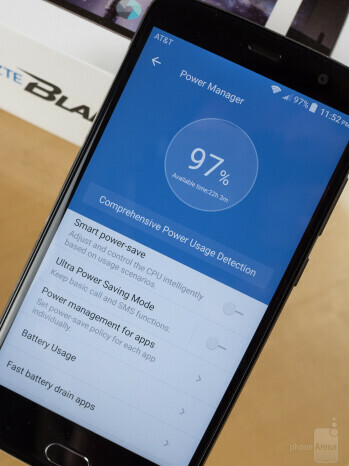 Not only is that battery life longer than competitors like the Honor 6X, but the ZTE Blade V8 Pro charges over twice as fast as that phone; with its included fast charger, that big 3,140mAh battery went from zero to full in a scant ninety minutes. It should suffice to say that if battery life is a major concern of yours, the V8 Pro absolutely delivers. Maybe the only way ZTE could improve things would be if the phone also supported wireless charging. We'd love it if the phone had a slightly tighter build, louder speaker, and delivered more impressive video recording, but none of these are deal-breakers by a long stretch – if anything, they just have us appreciating where the V8 Pro succeeds all the more. 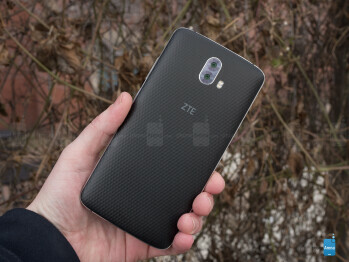 Maybe the most important consideration when evaluating the Blade V8 Pro is pricing, and there's little room for discussion here: ZTE absolutely nails it with a stunningly affordable $230 sticker price. That's not only more affordable than the Honor 6X, but the V8 Pro's faster performance, longer-lasting and faster-charging battery, and arguably more successful camera add up to make it an even better value, dollar-for-dollar. It's not the perfect budget phone, but it hits a whole lot of critical stops on the way to that goal. With another few tweaks here and there, ZTE's next mid-ranger could easily change our expectations for the sort of quality we can hope to get from one very affordable smartphone.